It is important to understand exactly what Sterling Silver is, and as importantly what it is not. There are some myths and much inaccurate statements made these days about Sterling Silver. Because it is less used these days for items other than jewellery there is a tendancy to associate the term with silver jewellery. Sterling Silver is not used as widely over the past 50 or so years as it once was for Silverware, Flatware and other items not associated with jewellery, having been replaced by other metals, and as such the true understanding of exactly what Sterling Silver is and what its is used for and the history behind it somewhat clouded - hopefully these pages will help to better understand this precious metal alloy. Fine silver, for example 99.9% pure silver, is generally too soft for producing functional objects; therefore, the silver is usually alloyed with copper to give it strength while preserving the ductility and beauty of the precious metal. Other metals can replace the copper, usually with the intention of improving various properties of the basic sterling alloy such as reducing casting porosity, eliminating firescale, and increasing resistance to tarnish. These replacement metals include germanium, zinc and platinum, as well as a variety of other additives, including silicon and boron. Alloys such as argentium silver have appeared in recent decades. According to the Oxford English Dictionary, the most plausible etymology is derivation from a late Old English steorling (with (or like) a "little star"), as some early Norman pennies were imprinted with a small star. There are a number of obsolete hypotheses. One suggests a connection with starling, because four birds (in fact martlets) were depicted on a penny of Edward I, and another, a supposed connection with easterling, a term for natives of the Baltic, or the Hanse, towns of eastern Germany. This etymology is itself medieval, suggested by Walter de Pinchebek (ca. 1300) with the explanation that the coin was originally made by moneyers from that region. The British numismatist Philip Grierson points out that the stars appeared on Norman pennies only for the single three-year issue from 1077-1080 (the Normans changed coin designs every three years), and that the star-theory thus fails on linguistic grounds: extensive research has been done on how coins acquire names, including nicknames. Grierson's proposed alternative involves an analogy with the Byzantine solidus, originally known as the solidus aureus meaning "solid gold" or "reliable gold". Even though English silver pennies were known for their consistent weight and purity in the days of Offa, King of Mercia, by the time of the Conquest English coinage had seriously degenerated. One of the first acts of the Normans was to restore the coinage to what it had been in the days of Offa, and to maintain it consistently. Grierson thus proposes that "sterling" derives from "ster"[note 1] meaning "strong" or "stout". Norman silver pennies changed designs every three years. This two-star design (possible origin of the word "sterling"), issued by William the Conqueror, is from 1077-1080. In England the composition of sterling silver was subject to official assay at some date before 1158, during the reign of Henry II, but its purity was probably regulated from centuries earlier, in Saxon times. A piece of sterling silver dating from Henry II's reign was used as a standard in the Trial of the Pyx until it was deposited at the Royal Mint in 1843. It bears the royal stamp ENRI. REX ("King Henry") but this was added later, in the reign of Henry III. The first legal definition of sterling silver appeared in 1275, when a statute of Edward I specified that 12 ounces of silver for coinage should contain 11 ounces 21⁄4 pennyweights of silver and 173⁄4 pennyweights of alloy, with 20 pennyweights to the Troy ounce. In Colonial America, sterling silver was used for currency and general goods as well. Between 1634 and 1776, some 500 silversmiths created items in the “New World” ranging from simple buckles to ornate Rococo coffee pots. Although silversmiths of this era were typically familiar with all precious metals, they primarily worked in sterling silver. The colonies lacked an assay office during this time (the first would be established in 1814), so American silversmiths adhered to the standard set by the London Goldsmiths Company: sterling silver consisted of 91.5 - 92.5% by weight silver and 8.5-7.5 wt% copper. Stamping each of their pieces with their personal maker's mark, colonial silversmiths relied upon their own status to guarantee the quality and composition of their products. Colonial silversmiths used many of the techniques developed by those in Europe. Casting was frequently the first step in manufacturing silver pieces, as silver workers would melt down sterling silver into easily manageable ingots. Occasionally, they would create small components (e.g. teapot legs) by casting silver into iron or graphite molds, but it was rare for an entire piece to be fabricated via casting. Next, silversmiths would forge the ingots into the shapes they desired, often hammering the thinned silver against specially shaped dies to "mass produce" simple shapes like the oval end of a spoon. This process occurred at room temperature, and thus is called “cold-working”. The repeated strikes of the hammer work hardened (sterling) silver, causing it to become brittle and difficult to manipulate. 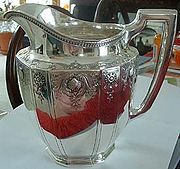 To combat work-hardening, silversmiths would anneal their pieces—heat it to a dull red and then quench it in water--to relieve the stresses in the material and return it to a more ductile state. Hammering required more time than all other silver manufacturing processes, and therefore accounted for the majority of labor costs. Silversmiths would then seam parts together to create incredibly complex and artistic items, sealing the gaps with a solder of 80 wt% silver and 20 wt% bronze. Finally, they would file and polish their work to remove all seams, finishing off with engraving and a maker’s mark. The American revolutionary Paul Revere was regarded as one of the best silversmiths from this “Golden Age of American Silver.” Following the Revolutionary War, Revere acquired and made use of a silver rolling mill from England. Not only did the rolling mill increase his rate of production—hammering and flattening silver took most of a silversmith’s time—he was able to roll and sell silver of appropriate, uniform thickness to other silversmiths. He retired a wealthy artisan, his success partly due to this strategic investment: although he is celebrated for his beautiful hollowware, Revere made his fortune primarily on low-end goods produced by the mill, such as flatware. With the onset of the first Industrial Revolution, many smiths followed suit and silversmithing as an artistic occupation eventually dwindled. This was especially true during the Victorian period, when etiquette dictated nothing should be touched with one's fingers. Encyclopedie, Denis Diderot's encyclopedia, which captured many occupations (including silversmithing) of the 18th century. Fr. the ancient Greek στερεός [stereos] = 'solid'. "sterling, n.1 and adj.". OED Online. December 2011. Oxford University Press. Entry 189985 (accessed February 28, 2012). Grierson, Philip. Anglo-Saxon Coins: Studies Presented to F.M. Stenton on the Occasion of His 80th Birthday, 17 May, 1960, edited by R.H.M. Dolley. Taylor & Francis. pp. 266–283. GGKEY:1JURCGTRPJ8. Retrieved 28 February 2012. Accounts and Papers of the House of Commons: 1866. Second. House of Commons. 23 March 1866. pp. 14–15. OCLC 11900114. Tunis, Edwin (1999). Colonial Craftsmen: And the Beginnings of American Industry. p. 81. Martello, Robert (2010). Midnight Ride, Industrial Dawn: Paul Revere and the Growth of American Enterprise. p. 42. Tunis, Edwin (1999). Colonial Craftsmen: And the Beginnings of American Industry. p. 83. Martello, Robert (2010). Midnight Ride, Industrial Dawn: Paul Revere and the Growth of American Enterprise. pp. 42–43. Martello, Robert (2010). Midnight Ride, Industrial Dawn: Paul Revere and the Growth of American Enterprise. p. 107. Martello, Robert (2010). Midnight Ride, Industrial Dawn: Paul Revere and the Growth of American Enterprise. p. 109. Kauffman, Henry J. (1995). The Colonial Silversmith: His Techniques & His Products. p. 126. Falino, Gerald W. R.; Ward, eds. (2001). New England Silver & Silversmithing 1620-1815. p. 156. Watt, Susan (2003). "How silver reacts". Silver. The elements. Tarrytown, NY: Marshall Cavendish. p. 13. ISBN 0-7614-1464-9. Falino, Jeannine; Ward, Gerald W. R., eds. (2001). New England Silver & Silversmithing 1620-1815. Boston: Colonial Society of Massachusetts. Tunis, Edwin (1999). Colonial Craftsmen: And the Beginnings of American Industry. Baltimore: John Hopkins UP. ISBN 978-0801862281. Martello, Robert (2010). Midnight Ride, Industrial Dawn: Paul Revere and the Growth of American Enterprise. Baltimore: John Hopkins UP. ISBN 978-0801897580.